I’ve created a design to better secure the box to the frame and use the planking for added rigidity. This included a set of 2 inch box channel crossbeams. The crossbeams are 7/16 inch through drilled and then one side is again drilled to 1 inch. 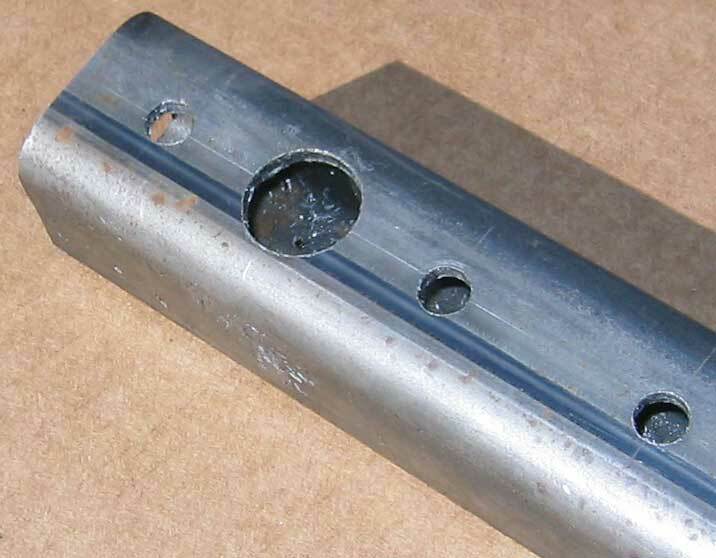 This allows a socket to pass through the 1 inch hole and secure the bolt or nut head inside the box channel. I ordered 3/16 inch mild steel. In retrospect, I should have bought 1/8 or 3/32 inch steel. It would have been strong enough, easier to work, and cheaper. I’m having trouble with drilling the 1 inch holes. The bit just chatters rather than biting into the steel and shaving out a continuous curl of metal. I was using a friend’s drill press which was a life saver for the 7/16 inch holes. Yet even at the slowest speed, the 1 inch bit chatters continuously. On occasion of the bit gaining purchase, the bit stalls rather than cuts. And that’s where we are to date. I was able to cut through one hole and part of a second. Time per hole was between 20 and 30 minutes. There are 90 holes. Do the math. Even if the bit were to hold out, which it wouldn’t, it is folly. I’m now in search of a machine shop to drill the remaining holes. In the meantime, I’ll continue the pre-paint prep work on the frame. Stay tuned.